Popular in Argentina, New York and Spain, padel is racket sport which is still relatively unknown in France. 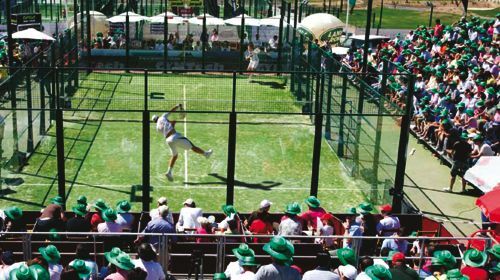 ….padel is typically played in doubles on an enclosed court about half the size of a tennis court. The balls used and the scoring is the same as normal tennis, just with a little less pressure, and so the biggest difference is that the court has walls and the balls can be played off them in a similar way as in the game of squash. The sport’s huge popularity along the Costa del Sol in southern Spain has exposed it to a large number of British residents and holiday-makers and this is one of the reasons it is beginning to take off in the UK. Padel is great for players of all ages and skills, as it is both quick and easy to pick up, and is less physically demanding than similar sports like squash. Most players get the grasp of it within the first 20 minutes of playing and find it easy to achieve a level of proficiency so that they can enjoy it because the game is not as dominated by strength and serve as tennis (in fact, the serve in padel is under-arm). Two new padel courts are now available at the Grand Stade les Capellans in St Cyprien. Places are limited so register now with Grand Stade les Capellans on 04 68 37 32 00. Saviez vous que vous avez plus de chances d’être tué par un bouchon de champagne que par une araignée venimeuse ?